It’s been 10 years since the Government bailed out Northern Rock during the 2007 financial crisis and took over their 400,000 customers’ mortgages. The homeowners thought they had been saved but are still trapped on high interest rates and their mortgages have now been taken over by an aggressive private equity fund. 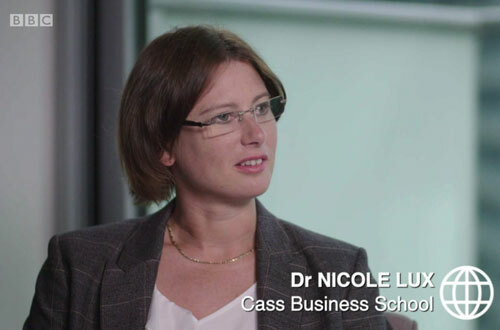 Cass Business School’s Senior Research Fellow, Dr Nicole Lux appeared on Trapped by my Mortgage as an expert to speak about high mortgages and their impact on the property market. Dr Lux discussed the impact of the government bail out on bond and stock holders of Northern Rock, and the windfall that was created by the Government’s buy out and then sale of the company. While the sale of 270,000 mortgages to Cerberus may have reduced government debt, Cerberus has a reputation for ruthlessly pursuing debts and this has caused problems for many homeowners. “They’re a private investment company, so they have private ownership, and their investors want to make the maximum return out of their investment, having now invested in mortgages. The majority of their money is coming from the interest payments that the homeowners are making under their mortgages,” she said. Dr Lux is a Senior Research Fellow and Project Director of the Commercial Real Estate Lending Report at Cass Business School. Her research focuses on real estate debt finance, credit rating, structured finance, Basel regulation and risk pricing. .